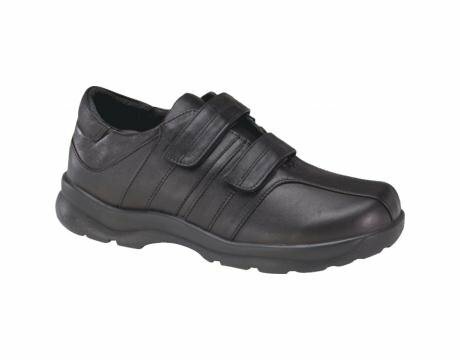 Aetrex Men's Two Strap Slip-Ons treat your feet to ultimate comfort with a customized fit This slip-on wraps your foot in an upper made of the finest, full-grain leather and moisture-transferring polyester fabric lining, but the best part is the insole. To customize your fit, peel away squares of the MozaicTM insole to relieve areas where you feel the most pressure. Double hook-and-loop straps across the upper offer adjustability to secure the fit. Crafted from the finest full grain leather and technologically advanced components available. With patented, removable Aetrex Orthotics and Pressure Relief System (PRS) insoles. This walker provides supreme comfort and support. Dual Velcro straps allow for effortless shoe entry. Available in three widths, Medium (C,D), Wide (E, EE), and Extra Wide (3E, 4E).